Many men and women shy away from orthodontic treatment when they think of traditional metal braces to straighten their teeth. Fortunately, there are alternatives such as Invisalign. With Invisalign, adults and teenagers can attain the smiles they want in less time than traditional orthodontic treatment. Dr. Stanley Levenson and our team at Levenson Smile in Worcester, MA have been providing Invisalign to patients for more than 10 years. 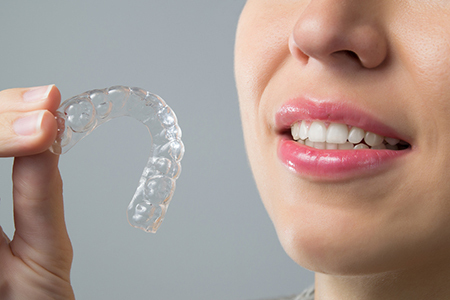 The Invisalign system includes a numbered series of clear aligner trays that are worn in order. They are changed every two weeks. Each tray gradually moves the teeth into their ideal positions. The trays are virtually unnoticeable when smiling, making them ideal for adults and teenagers. Invisalign is used to treat malocclusion, overcrowding, and crooked teeth. Anyone who wants to explore Invisalign should contact our office for a consultation with Dr. Levenson. Dr. Levenson has treated hundreds of patients with Invisalign. During a consultation, he will want to know a patient’s goals and will review their medical history. If the patient is a candidate for Invisalign, the doctor will tailor a treatment plan to meet his or her needs. Treatment requires compliance. The trays must be worn at least 20-22 hours a day; however, they can be removed for eating, drinking, brushing, flossing, and special occasions. It is also critical to keep the mouth, teeth, and gums healthy with excellent oral hygiene habits. If you want to know if Invisalign is right for you, schedule a consultation with Dr. Levenson by calling 1-855-849-8255. He would love to help you achieve your smile goals.